The pulsar J1906+0746 has gone silent, and that’s good news for general relativity. A pulsar is a rapidly spinning neutron star. 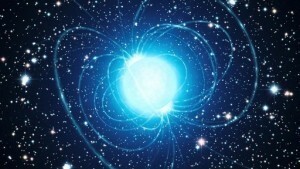 Neutron stars have incredibly strong magnetic fields. As a charged particles are trapped near the magnetic poles, they give off intense beams of radio waves. The rotation of the neutron star (and thus the poles) sweeps the beam around, much like the light from a lighthouse. When the beam is facing us, we see a pulse. This particular pulsar is a close binary, and orbits another star of similar mass. The two stars are separated by about the width of our Sun, and orbit each other ever four hours. They are so close to each other that their orbits are affected by general relativity, including the effect of gravitational waves. Over the past five years, a team has monitored the pulsar continuously, capturing about a billion pulses from J1906+0746. The goal was to compare the orbital predictions of general relativity with the observed orbital behavior of the pulsar. Not only did the observations match, the team also observed the pulsar fade over time, which is another prediction from general relativity. The pulsar hasn’t actually stopped emitting energy, but its beam no long sweeps in our direction. That’s because the axis of rotation has shifted, through a process known as precession. We see this effect with Earth, where due to the gravitational pull of the Sun and Moon, our north pole drifts relative to the stars. This is why our current north star hasn’t always been the north star. In general relativity precession also occurs, but it happens at a slightly different rate. In the case of this pulsar, that is about two degrees of drift every year. The pulsar hasn’t disappeared forever, though. We should start seeing it pulse again around 2170.